Roberts Space Industries wants to know if fans would like to see Star Citizen take a shot at Kickstarter. 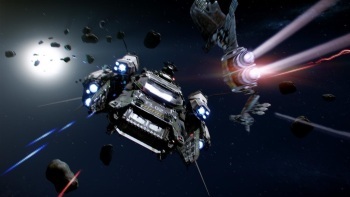 Roberts Space Industries is crowdfunding its new Star Citizen project, but rather than run it through Kickstarter it's raising the money all on its own. The studio explained in the FAQ that by going it alone, it can better connect the "crowd" with the creators. "By building a crowd funding component directly into our site we can insure everyone who wants to back the game can - we provide multiple payment options to make sure that wherever in the world you are there is an option that can work for you. It means you just have one destination to support the project, read updates, and most importantly participate with other members of the community!" it says. "Kickstarter, as great as it is, can't deliver this experience, which is why we've decided to go it alone." Flying solo has led to some issues, as the rush to throw money at the new game from the guy who did Wing Commander overwhelmed the RSI servers, but that all appears to be smoothed out now. Even so, it appears that minds might be changing, as a message posted last night on the Roberts Space Industries Facebook page asked fans what they thought of the idea. "The opinion of all of you as a community is paramount to us and we are listening," it says. So far, over 900 people have expressed their desire to see Star Citizen on Kickstarter by "liking" the post, a relatively small amount compared to the 9300-plus who have already pledged to support the game. Even so, I wouldn't be surprised to see it happen; Obsidian's Project Eternity recently blew past the Double Fine Adventure to become the most successful videogame Kickstarter ever, so that well obviously hasn't run dry yet.